WIDISOFT: Software for automatic music transcription. Windows, MacOS X, VST plug-ins and Audio Units. Here you can download and purchase WIDISOFT software. All software is distributed as "try and buy", and you can download the evaluation versions for free. Evaluation editions contain some limitations, which are removed by entering registration code if you purchase it. We encourage you to evaluate the software for free before buying it, so we do not provide refunds. More detailed info about WIDISOFT and our products is available in English and in Russian. Our software can be ordered online world-wide. If you are interested in reselling our software, please contact us at info@widisoft.com. If you ever tried to fit accompaniment or tune to your favorite song, you may be already familiar that this process is time consuming and effortful. WIDI Recognition System aims to help you with this. WIDI allows transcribing audio recording (Wave, MP3, CD-Track or other format) into MIDI file, the latter being in fact notation of recorded music. WIDI allows transcribing polyphonic recordings, not just a single tune. The output file follows MIDI standard and therefore can be opened and edited in any Note editor. WIDI Professional includes TrueTone MIDI Editor designed especially for further refining the resultant MIDI in a fast and easy way. The plug-in transcribes music in real-time. The signal spectra, along with recognized notes are displayed in plug-in's window. Also, plug-in displays detected chords in conventional letter notation. The adjustable recognition parameters serve to improve the recognition quality. The plug-in supports several MIDI output methods, including recording to MIDI file. Important: WIDI Audio To MIDI plug-in is not a standalone software and requires a VST or AU host program to run. 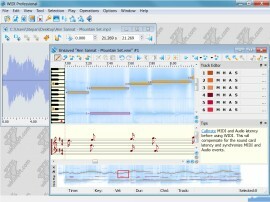 Able MIDI Editor is a powerful and inexpensive Piano-roll MIDI Editor for Windows. Among the basic functions of Able MIDI Editor are its capability of adding and deleting musical notes, adjusting the pitch and duration of notes. The Editor also lets you to arrange bar-lines manually or by ear with the Tapping Tool. The Editor provides a means for working with MIDI tracks. Most of the tools that Able MIDI editor provides are applicable to both single notes and arbitrary groups of notes. WIDISOFT support service is available via email support@widisoft.com. Please use English or Russian if possible. WIDISOFT is a Russian software company that develops software for sound and music processing. Our main focus is on the developing algorithms for music transcription and music information retrieval. If you are interested in becoming our local dealer, contact us at info@widisoft.com. What is Music Recognition or mp3 to MIDI conversion? Wave, mp3 and midi are the most popular file formats for storing audio and music. Here we explain in brief why MIDI is very the different compared to Wave or MP3. The most simple is Wave. It is a record of sound pressure on microphone on time. Any sound can be recorded as wave file, but wave does not allow editing sound components and occupies a lot of space. MP3 is a compressed wave. It takes several times less space, but does not allow separation and component editing as well. In opposite, MIDI can store only musical sounds. MIDI is a command system, containing information about a note, about the instrument and its change, the length of pressing and so on. This kind of a record can easily be edited and takes less storage space than wave. More information about MIDI can be found on What is MIDI page (in English). The difference between Wave and MIDI is much the same as that between the typed text and an its image. It is easy to convert typed text to image, but the reverse operation is much more laborious and ambiguous. For example, automatic recognition of hand-writing can't be accomplished without errors till now. WIDI Recognition System and WIDI Audio To MIDI Plugins contain special algorithms that can analyze musical audio recordings and automatically reconstruct notation of musical piece. TrueTone Editor of WIDI Professional allows improving of recognition result by offering tools for efficient correction of any transcription errors.